Most of us have a desire to accomplish something bigger than we can accomplish alone. When followers are drawn to a leader with an attractive vision, a unifying purpose, there is no limit to what we can accomplish together. Followers choose to follow a leader with a compelling purpose, vision, cause, or goal, the unifying purpose. It is the leader’s unifying purpose that attracts the interest and loyalty of followers. The leader is someone who is able to communicate the unifying purpose in a manner that is inspiring, persuasive, or motivating. The unifying purpose joins the followers to the leader. The Creative Followership logo illustrates the three essential components of leadership, followership, and unifying purpose. The large arrow represents the unifying purpose. The small arrows represent the leader and followers, held together by the unifying purpose. The leader is in the center of the unifying purpose, out front, leading the followers. The followers have joined the leader and are supporting him in fulfilling the unifying purpose. What’s Our Point of View? All articles on this blog are presented from the follower’s point of view. We know that all followers report to a boss, and that the boss may or may not be a leader. Our expectation is that all Creative Followers will, at some point in their career, find a leader. Effectively executed Creative Followership creates a relationship of mutual trust and support between the follower and the leader. We realize many followers become executives with varying levels of responsibility and authority; however, the primary focus of Creative Followership is on personal development. Our purpose is to illustrate the opportunities of Creative Followership. We want you, the dedicated followers, and the potential followers, to be inspired to use the path of Creative Followership for your journey to success and satisfaction. We invite you to become a Creative Follower. Born in an unpainted share-cropper house in the middle of cotton fields, Jimmy Collins dreamed of becoming an executive. His story of the pathway he discovered for the realization of that dream is told in his book, In the Shadow of Greatness. He named that pathway Creative Followership. Jimmy is certain that anyone can use his Creative Followership Principles for their own journey to success and satisfaction. From his first job of delivering groceries on a bicycle at 12 years old, to establishing his own business as a commercial kitchen design consultant, to his 32 year career with Chick-fil-A, Inc., he learned and applied the principles that you also can learn. Jimmy retired from Chick-fil-A, Inc. as president, Chief Operating Officer. 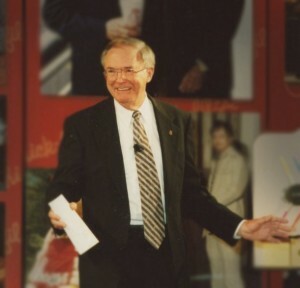 He describes his role there as the chief follower of the founder, S. Truett Cathy. In year 2000, Jimmy received the prestigious Silver Plate Award as Chain Fast Service Operator of the Year. He is the founder of Creative Followership L.L.C, and an author. Michael Cooley enjoys the challenge of creative communication using words and images. He is a free-lance writer, speaker, multi-media producer, and an enthusiastic presentation coach. For over 26 years Michael has enjoyed providing professionals and executives with previously unthought-of means to illustrate ideas and concepts. Not content to consult in communication only, Michael believes our attitudes and actions are just as important as what we deliver in print or presentation—everything “speaks.” Certified in training by the Protocol School of Washington, he trains and advises individuals and organizations in hospitality, business etiquette, and international protocol. Philosophy and theology have always been a passionate interest for Michael. He has a BA in Religion and Philosophy (Mercer University), a M.Div. (Southwestern Theological Seminary), and a Master of Arts in Philosophy (Fordham University). In his spare time he enjoys fly-fishing and sporting clays. He lives in Atlanta, Georgia with his charming wife, two brilliant children, and three vacuous dogs.